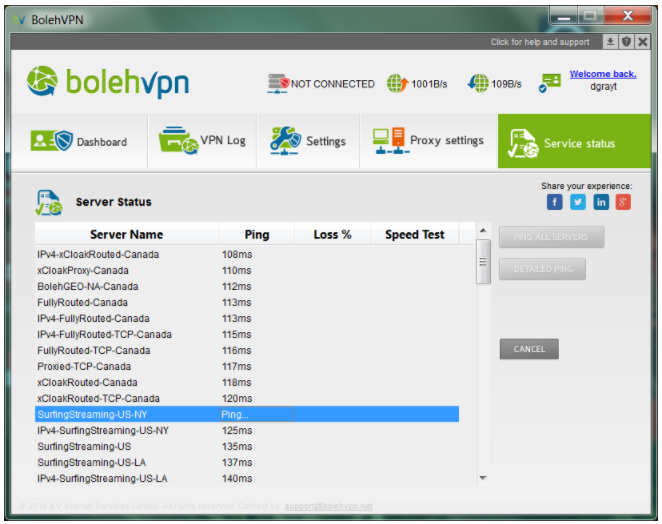 Boleh VPN is a Seychelles-based provider that’s been in the business since 2007 and has established itself as reliable and private. With servers in 13 countries, Boleh might not have the largest coverage, but it just might be what you need if the USA, Europe, Malaysia, Japan, and Singapore are within your interest zone. They support OpenVPN and L2TP and provide native clients for most popular platforms. Robust encryption, good privacy, and just about enough advanced tweaks take Boleh to my list of feasible options for a long-term commitment. They offer a three-day free trial – all you need is your email to sign-up. But be warned – when you receive an activation email and follow the link, be careful not to hit “register,” but look for “activate my free trial.” Otherwise, you are left with the paid options and no free trial. They accept Paymentwall, credit cards, Yandex money, PayDollar, Bitpay, PayPal, MEPS, and Bitcoin. On top of that, BolehVPN has a 14-day refund policy – renewals and payments made with Bitcoin don’t qualify for a refund. Also, you have to report your problems and give their tech support a chance to troubleshoot your issues before you can claim your refund. Seems fair enough to me. BolehVPN comes packed with software for Win, Mac, Linux, and native Android and iOS apps. There are also guides on how to install it on several types of routers. While the dedicated Windows and Mac OS applications are easy to install and run, Android app requires some reading, config files downloading and copying to respective directories. You will also need to uninstall any other OpenVPN-based apps from your device. The mobile app setup is not all that difficult, but if you’re a newcomer to the VPNs, the setup guide alone might look intimidating. The user dashboard is fairly intuitive and comes complete with installation guides and download links wrapped in one. The desktop app looks good if a bit cluttered. If you know a good deal about VPNs, you will have no problem sorting out its tabs that let you enable a kill switch, keep an eye open on the app’s logs, or set up the proxy. 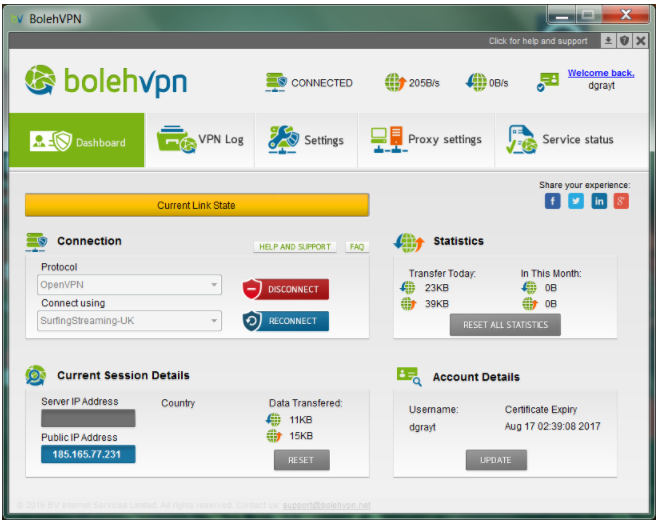 The main tab displays your IP, data transferred and received, and account details. The Connection area lets you choose a protocol (OpenVPN or L2TP), and the server. The servers list must be the most confusing part if you’re not familiar with the VPN jargon. If so, you’d have to read the FAQs to learn your basics. In my tests, the desktop app would crash after disconnecting, and quite a few servers hampered my speed tests. But when I found the servers that worked, they worked just fine. BolehVPN doesn’t have a live chat support, so you can drop them a line by email or try to sort out your issues by scouting the guides and the forums. Other low-level tweaks let you enable a kill switch, an auto-reconnect, and a DNS leak protection, as well as tweak proxy settings, and the type of servers you want to load on app startup. Most of the app is intuitive, but I’d give the servers simpler, layman names or offer an immediate explanation as to which configuration does what in the floating pop-ups right there in the UI. You can run BolehVPN on up to three devices simultaneously if you’re a paid subscriber. Torrenting and streaming are allowed, but you’ll need to know which servers support it. For instance, servers dubbed BolehGEO and Surfing-Streaming are no good for torrenting due to limited bandwidth or provider policies. Again, I see a serious usability flaw in the way Boleh dubs its servers. It took me a while to measure Boleh’s speeds as many servers would give the SpeedTest by Ookla desktop app no-nonsense hiccups. It takes a bit of patience and time to get it to work. With the wealth of servers at hand, I was sure I’d be able to unblock my streaming favorites – Netflix US and BBC iPlayer. Unfortunately, none of that happened. Security-wise, the most secure server configuration is the xCloak, which relies on 256-bit AES encryption, SHA-512 HMAC and an additional layer of scrambling obfuscation on OpenVPN, with a kill switch and a DNS leak protection enabled. Port forwarding is available for Switzerland and Luxembourg servers dubbed as Fully-Routed. The provider will log usage in the case of an unusual bandwidth load to detect network abuse (i.e. DDoS, spamming). Overall, Boleh looks solid on privacy and security, and the reasons for termination or logging sound legitimate.